She was thrilled when I brought this fabric home. 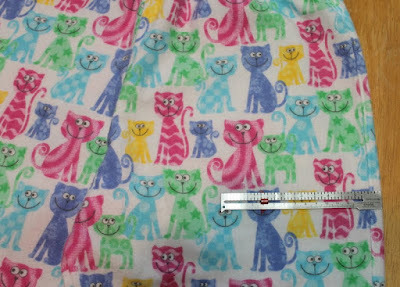 Fabric was purchased off the clearance table at Hancock's Fabrics for @$3.50/yard.These cats measure @1 1/2", so they are not small. Love the happy smiles and almost a googly-eyed effect. She was so excited, it motivated me to have these made for her before night's end, even though we are suffering with daily 97 degree F temps and these probably won't be worn until Fall. I love my daughter. 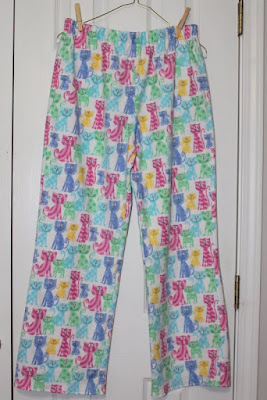 This was the 6th pair of pajama pants I've made for her since 2011, using McCall's M4979. Such an easy pattern. Great for beginners. I've also made myself a comfy outfit from the pants and jacket you can see here. But this is really 'her' pattern, so I've customized the pattern to fit her. 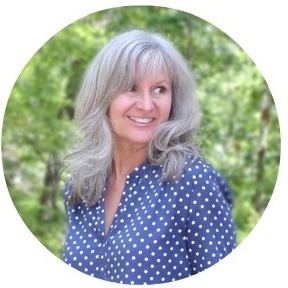 She wears an XS size with serged seams as the seam allowance. I do reinforce the crotch seam with my sewing machine. These pants are high rise, something she does not care for, so I simply turned the top waistline down on both pieces by 5/8". With a 1" elastic, the casing is turned down 1 3/4". She likes this. She still pushes them down a little and they are quite baggy, but that is what she wants. The legs are baggy, wide and looooooooong. I've shortened this pattern 4" and hem by barely turning up the fabric's serged edge. For the next pair, I may lengthen an inch, so she can at least have a 1" hem. She does not care for pockets (can you imagine?!)..... so no pockets, the pattern does not include pockets, but I've been putting pockets into all my garments recently and knew it would not be a big deal to add them here. I did faux flat fell the serged outside seams again. So much easier to do without a pocket to deal with! You can see a little of the topstitching in the photo below. And I almost matched up the fabric. Sort of. Tried to get the cats at least lined up across the front. All in all these pants take maybe @2 hours to make from start to finish. I really like how Hancock's flannel fabric fluffed up after pre-washing and drying. So many times the flannel I've bought at WalMart comes apart from within the fibers after she wears her pants a few times, so I've become extra careful when purchasing flannel fabric. Couldn't believe I almost forgot to put one of my little tags in for her to tell, at-a-glance, the difference between the back and front. No extra story today. 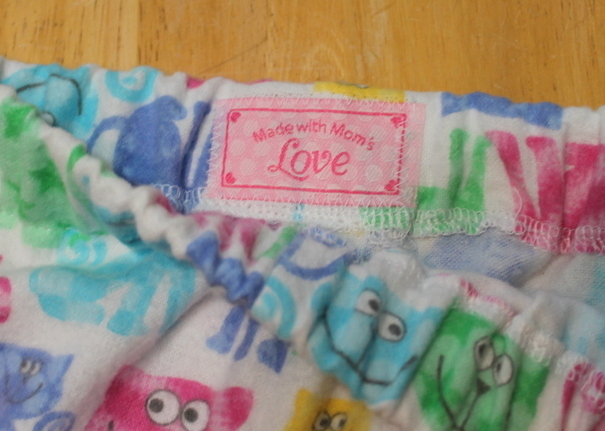 This one was pretty cut and dried.... but I will say I feel privileged that Melissa, my daughter, still likes for me to make her pajama pants. I've made her pajama pants for her since she was a little girl, and to this day she only wants to wear the ones I make for her. She won't let me make anything else for her, as she has a very distinct way she likes to dress and she tells me she would feel bad if I made her something and she ended up not wearing it. She is sweet. 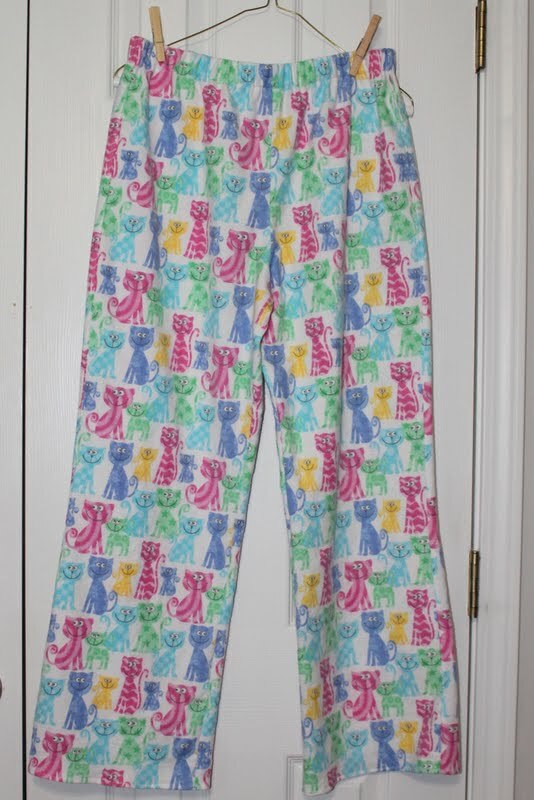 So I am glad she likes her pajamas pants made by me. So actually there is an extra story about how you always made your daughter pj pants ;-) Andi liked it! 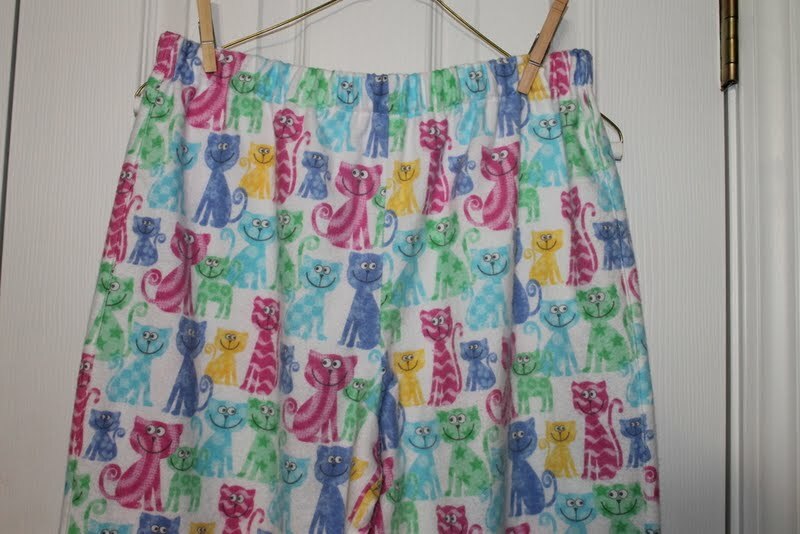 But I'm not supposed that she still wants you to make her those pants because these look just adorable and I love how neat you sewed them and paid attention to details! I guess there was an extra story after all. :) Thank you Katharina! 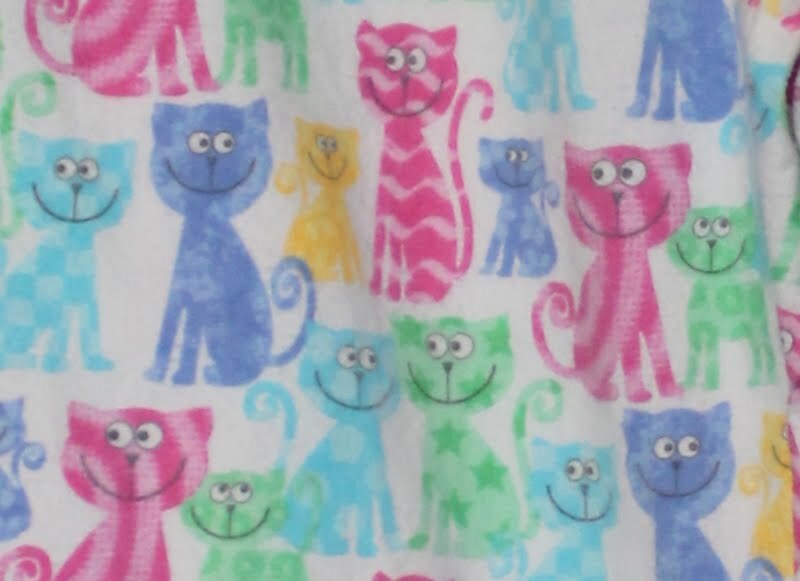 Sweet pj pants for a sweet daughter! From a sweet mom, by the way. I do love the fabric! I am a really bad mom. My daughter asked me to make her a couple of cool, sleeveless tops to wear this summer and I've told her I just don't have the time to do it. 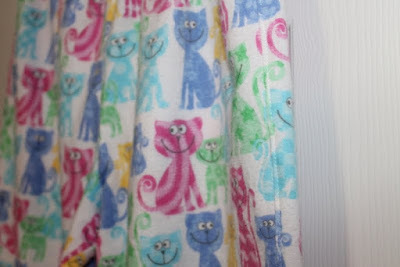 I can see why she likes the googly happy cats -they are so gorgeous - and the cut, low and wide is just how the youngsters like them at the moment - and I can recall hating pockets at that age, thinking that they "stuck out". You are wise to stick to sewing what your daughter wants. Sweet pants! 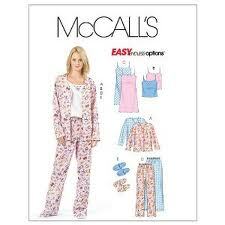 I think it's a great compliment that she's letting you make her pjs. She will love these, I'm sure of it. Oh, I like 'cat's meow' too! 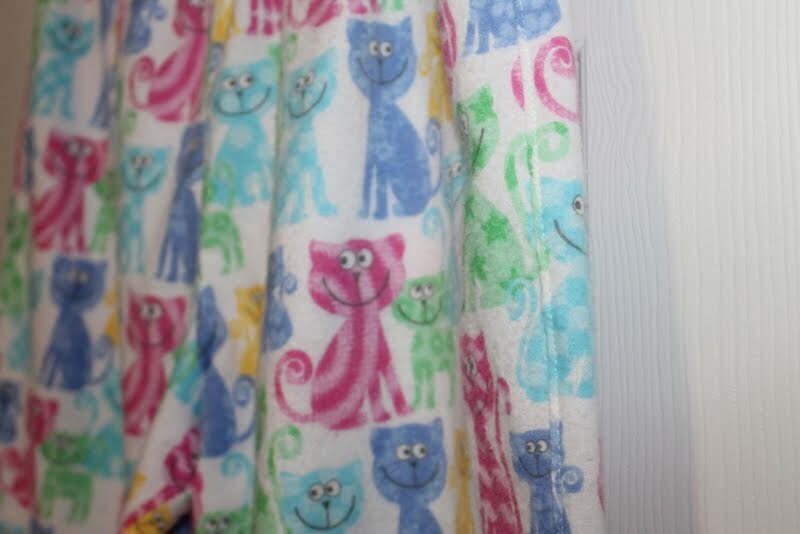 Cute and colourful pyjama pants. The cats are gorgeous. That fabric is adorable! 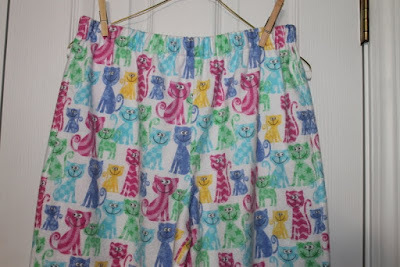 It's funny, pyjama pants are just about the only thing my daughter does not ask me to make for her; hmmmm! I hope my daughter will wear more things I make in future - she is so fussy! Love the cat fabric, it is fab.